Four years in themaking, Ashton Symmetry is the first new cigar launched under the Ashton brand name in nearly a decade! Handcrafted in the Dominican Republic, Ashton Symmetry is blended by legendary cigar-maker, Carlito Fuente. Beautiful Habano wrappers grown in the cloud-covered fields of Ecuador accompany a bold, yet balanced blend of proprietery aged tobaccos. 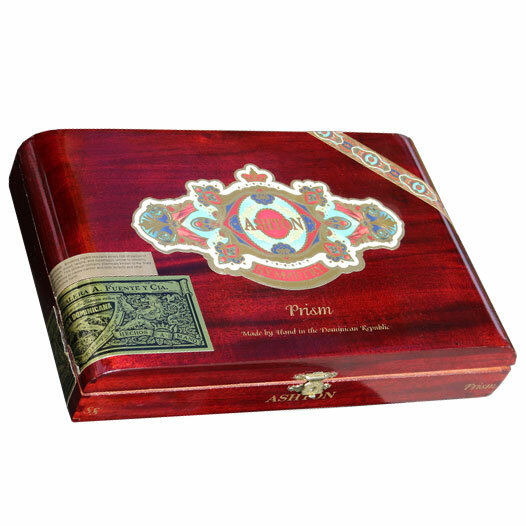 This exclusive blend features Dominican tobaccos from Chateau de la Fuente and Villa Gozalez, as well as some rare leaves from the Fuente families Un Buen Vecino farm, located in Esteli, Nicaragua. Meduim to full bodied, Ashton Symmetry offers a wonderful creamy richness garnished with notes of spice, oak and toasted nuts.